Heat a large skillet medium-high and add 1 tablespoon oil. Add bell pepper and stir-fry until it softens. Continue to cook until it starts to blacken slightly. Remove bell pepper and set aside. Heat a small saucepan on low and simmer salsa to keep warm. Do not boil. In the same skillet bell pepper was cooked in add 1 tablespoon oil. Add shrimp and cook 1-2 minutes on each side until it turns pink and begins to curl. 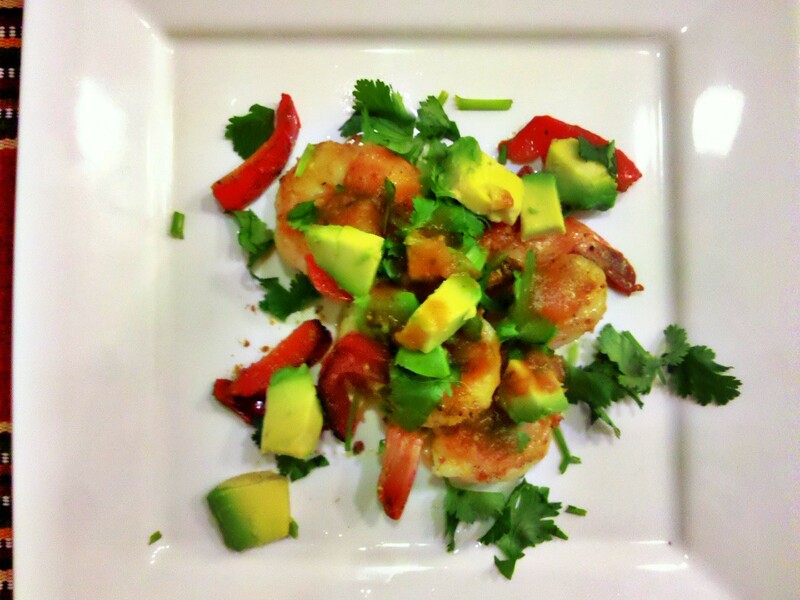 After shrimp is cooked, season with garlic powder, return bell pepper to skillet and stir fry for 30 seconds. Divide the shrimp and bell pepper onto 4 plates. 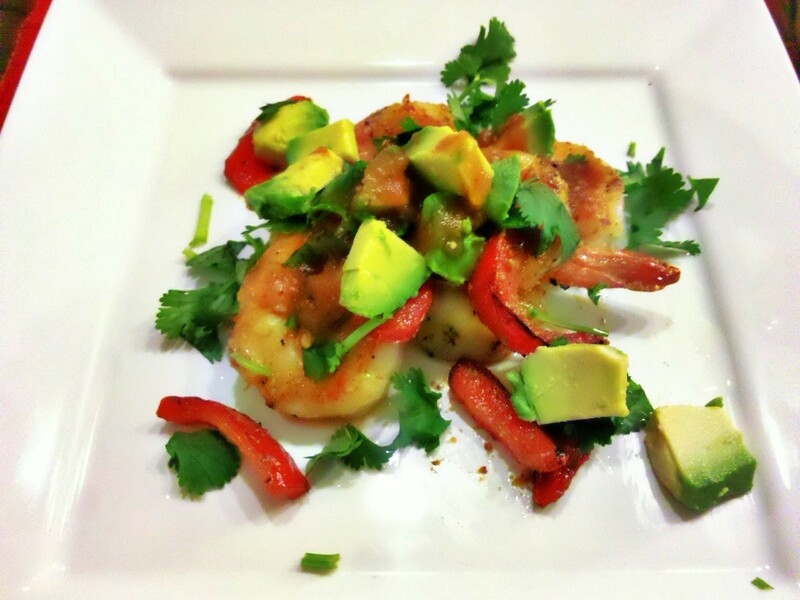 Top with avocado, cilantro and lime juice from 1 lime wedge. Then top with 1 tablespoon warmed salsa. Serve with extra lime wedges and salsa on the side. Yum! I love shrimp! And anything with avocado! Sounds like a nice wine pairing as well!! You just gave me an idea … I have family flying over tonight I think this will be an easy dish to put together to serve. Nice! Always looking for a new seafood recipe…thanks! Hi, thanks! Please feel free to try it. It’s easy fresh and delicious. This dish looks amazing! Thank you for stopping by my blog and the like on my Bacon Sirloin Skillet recipe! What a delicious looking meal. I’ll be trying it soon! Thanks! I think you’ll enjoy it! Totally my style of eating! Love these flavors. Yum! Thank you for your comment! This shrimp plate makes for a refreshing meal on a hot day too. Sounds delicious!! And the picture makes it look even more appealing!! I think I’d enjoy this with a not-so-sweet Riesling or perhaps a Sauvignon Blanc! Love your blog! Thank you for your comment and your wine pairing suggestion! Now this looks like one to share w/my daughter. We both love avocado but can’t find a way to sneak it in something so my husband won’t find it. But I know Niki will love this one. Thank you Gemma! I use my Droid (phone) to take all my cooking photos. Really? Its better than mine and I use my camera – need to invest in a better camera I think!! Ah well! Hi! Thank you for your comment. I really like your blog name “trials in food”. Kind of like life ..